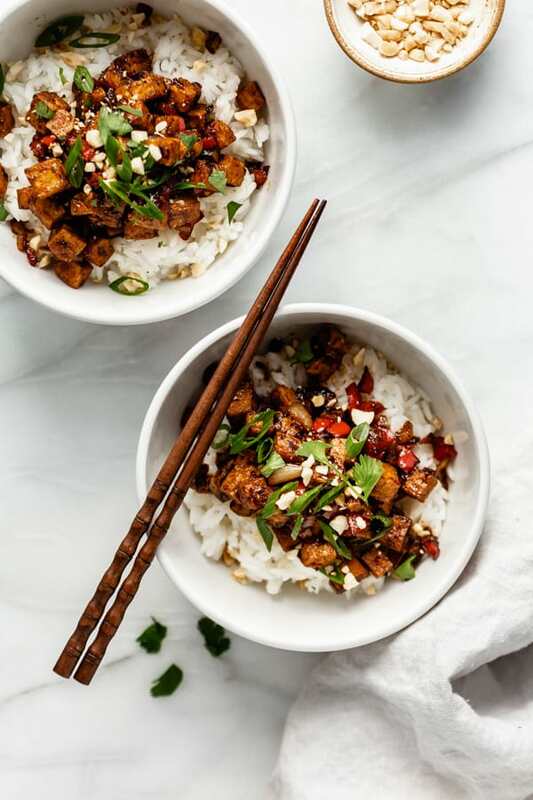 This kung pao tofu recipe is easy to make and comes together in less than 30 minutes! Enjoy this healthy vegetarian recipe for dinner tonight! Today we’re doing a tofu recipe. 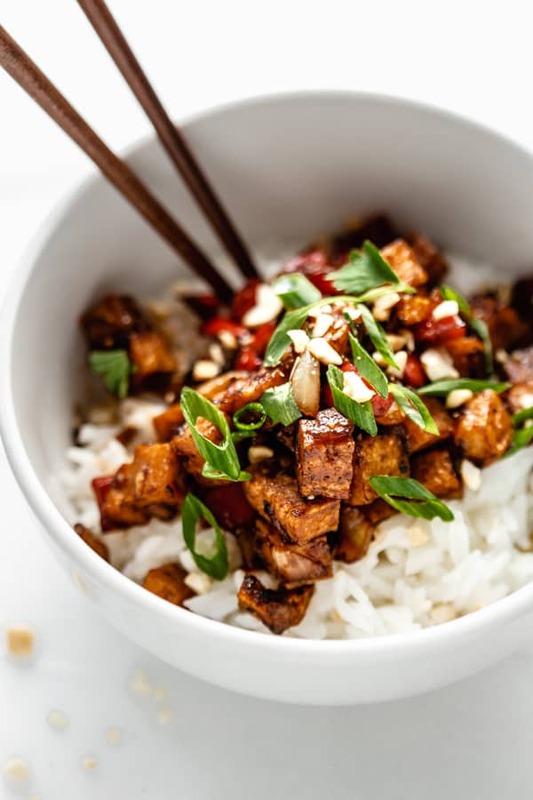 And not just any tofu recipe, KUNG PAO TOFU. 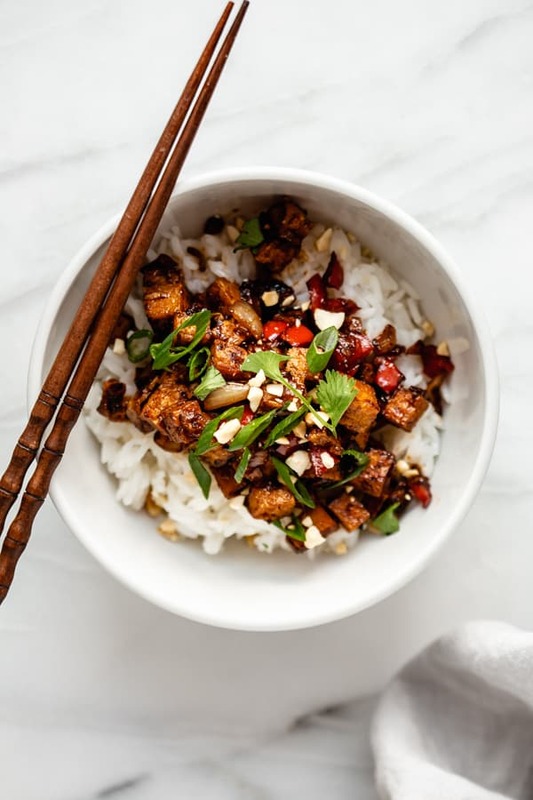 Superrrr crispy little cubes of tofu tossed up in a spicy and tango kung pao sauce served with veggies, peanuts and rice. Sounds pretty good, right? This recipe is naturally vegan and gluten-free. 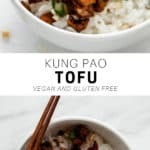 It’s a great dinner option to suit all diets and if there is a tofu recipe to convert meat lovers THIS IS IT. Seriously. This recipe is the bees knees. 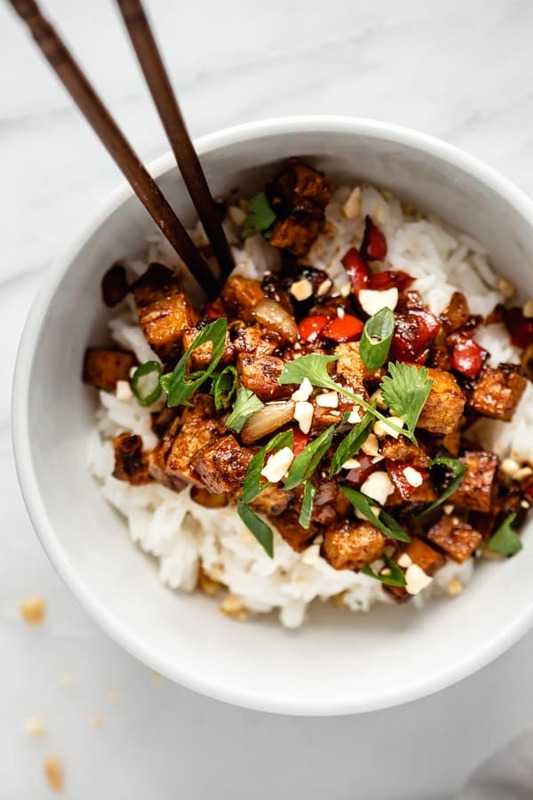 The secret to making a delicious kung pao tofu is all in the way you cut the tofu. So here’s the deal: we want to cut the tofu into SMALL CUBES. You heard me, no large tofu chunks here. Small cute little cubes. This will give each bite of tofu more surface area to be nice and crispy and extra saucy. #yum. 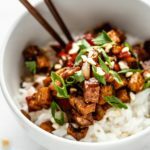 Kung pao tofu is a great dish to make when your looking to have dinner ready in 30 minutes or less. Start by cutting the tofu into small cubes. (Seriously, don’t make them big!) Then the tofu gets fried in a pan on each side until they are completely crispy everywhere. Don’t skip this step! This is where the magic happens and the tofu transforms into perfect crispy little bites. Then the veggies get sautéed in the pan with the tofu, the sauce gets added and everything gets all mixed together to perfection. It’s important to use firm or extra firm tofu for this recipe and to squeeze out as much water as possible from your tofu. This ensures that you get perfectly crispy tofu bites. If you like to have any green veggies in your stir fries, you can add in some chopped broccoli, bok choy…etc. to the recipe. Just let your veggies sauté in the pan for 2-3 minutes then add the sauce. I like to put up a pot of jasmin rice right away before I start prepping my tofu, which takes about 20-25 minutes to cook. This way the rice is ready to go! 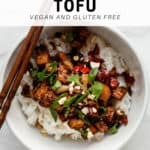 While you can store leftovers of this recipe in the fridge for a few days however the tofu is best enjoyed right away so it has that like crispy bite to it! 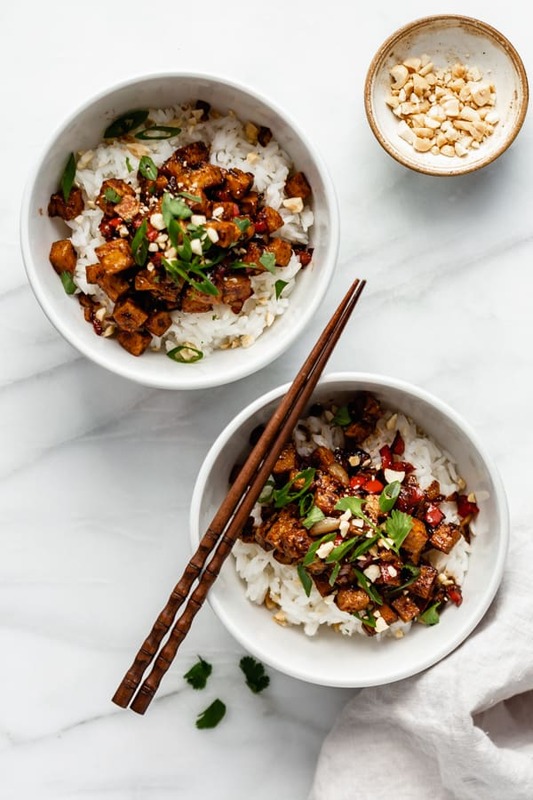 Crispy mini tofu bites get coated in a spicy and tangy kung pao sauce. YUM. Push the tofu off to the side of the pan then add the remaining 1/2 tbsp of avocado oil, onion, garlic and pepper. Let the veggies cook for 2-3 minutes, then mix the tofu back in. Reduce the heat to medium-low and pour the sauce in the skillet, mixing everything together. Taste and adjust seasoning if needed. Serve over rice and top with crushed peanuts and cilantro. This recipe is best enjoyed right away so the tofu stays nice and crispy! In Iridescence | Dishing out healthy + gluten-free recipes with a side of sustainability. Sounds Delicious! I’ve just recently been introduced to the world of tofu and the last two times I’ve tried to make it, it did not turn out great. I can’t wait to try this recipe!